PRESS RELEASE: Following the release of the award-winning NBKing head and cab, Randall Amplifiers announces the new Nuno Bettencourt signature combo amplifier, the NBKing 112. The NBKing 112 is an all tube 30 watt combo amplifier powered by 4 EL84 tubes. It utilizes the same 3 channel preamp found on the 100 watt Randall NBKing head. 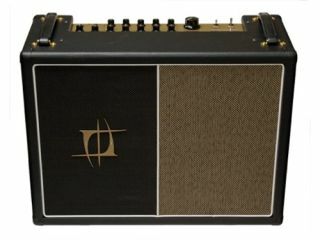 The top facing gold control panel contains 2 full featured channels, clean and overdrive. The third channel is a dedicated solo channel containing drive and volume controls. An oversized volume control and analog VU metre contribute to a vintage and boutique vibe. Two top mounted carrying handles make transport effortless. An effects loop and MIDI in/thru footswitch connections add versatility. The Randall NBKing 112 is expected to be priced around £1015 ex VAT and available Q2 2010.